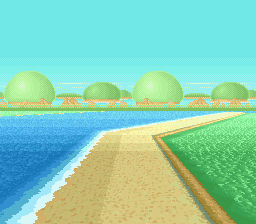 Crescent Coast is the fourth level in the game Yoshi's Safari. It is located in the Light Realm. As the name implies, the level takes place on a crescent shaped coast. 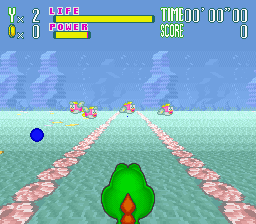 The beginning of the level consists of a sandy beach that Mario and Yoshi must traverse. Nipper Plants, Flying Goombas, and Koopa Para Troopas are common throughout this portion of the level. Mario and Yoshi will eventually reach the end of the beach and enter the water. The second part of the level is entirely underwater. Cheep Cheeps are common during the first and final stretches, though Bloopers are much more common in the middle portion leading to the Octopot. At the end of the level, the player battles Larry Koopa. The Koopaling fights Mario and Yoshi using a mecha closely resembling the sun. The mecha first revolves around, occasionally opening its blasters to shoot green balls. Mario must shoot the blasters each time they appear to damage the mecha. 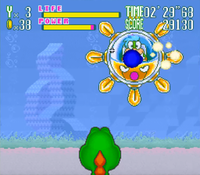 After taking half health, the mecha's external armor is destroyed, revealing Larry inside the cockpit and a face that shoots bubbles at the duo. The mecha must be shot at each time it reappears. Defeating Larry and collecting the fourth gem ends the level. This page was last edited on March 21, 2019, at 10:08.